Tint the vanilla frosting light pink with the food coloring. Spread the top of the cupcakes with some of the pink frosting and make smooth. Snip a ¼-inch thick slice from a marshmallow, crosswise. Dip the cut side of the thin marshmallow slice into the pink sugar to coat. Cut the sugared slice in half crosswise and form into 2 ear-shaped triangles. Reserve the larger piece of marshmallow for the pig's snout. Repeat with the remaining marshmallows. Press the larger piece of the marshmallow, cut side down, onto the lower half of the cupcake for the pig's snout. Press 2 sugared marshmallow ears into opposite edge of cupcake, as pictured. Press the chocolate chips in for the piggy's eyes, pointed end down. Pipe a mouth and nostrils onto the cupcake with the black decorating icing. Place the cake on a clean work surface. Using the bread knife, trim a 1 ½-inch triangle-shaped notch from opposite sides of the cake (see template). Discard scraps. Place the trimmed cake onto a serving platter. Cut ½ inch from one side of each doughnut. Spoon ¼ cup of the untinted vanilla frosting into a resealable plastic bag. Add enough red food coloring to 2 Tbsp of the vanilla frosting to tint it red and spoon it into a separate resealable plastic bag. Add a few drops of the red food coloring to the remaining vanilla frosting to tint it a pale pink. 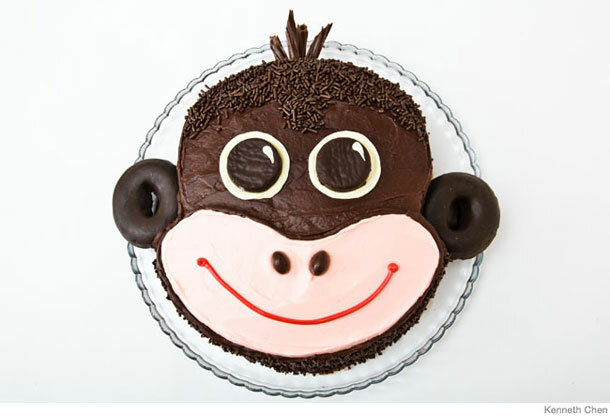 Spread the chocolate frosting onto the top and sides of the cake, avoiding the lower half of the monkey's face. Spread the pale-pink frosting into a kidney bean–shaped area over the monkey's mouth, chin, and cheeks, as pictured. Press the chocolate sprinkles into the forehead, the top of the head, and the underside of the monkey's chin. Press the trimmed edges of the doughnuts onto the cake for the monkey's ears. Press the M&M's or the jelly beans into the center of the cake to make the monkey's nostrils. Snip a very small corner from each bag of frosting. Pipe a red frosting line onto the pink part of the cake for the monkey's smile. Pipe 2 white circles onto the top of the cake for the monkey's eyes and press the peppermint candies into them. Add a dab of white frosting for the sparkle in each eye, as pictured. Snip the chocolate Twizzler into thin 2-inch strands with kitchen shears or clean scissors and insert them into the top of the cake for the monkey's hair. Trim the top side of all of the bowl cakes to make level. Trim ½ inch from the curved bottom of one (1-quart) cake and place it wide side up on a serving platter. Spread the top of the cake with some of the chocolate frosting. Place the other quart cake on top, flat side down to make a ball. Repeat the trimming and assembling process with the 2 (12 oz) bowl cakes. Spread some frosting on the top of the larger ball and place the smaller ball cake on top as the head. Insert a chopstick or wooden dowel in the center to help balance the cakes (see template). Spoon 1 Tbsp of the vanilla frosting into a resealable plastic bag. 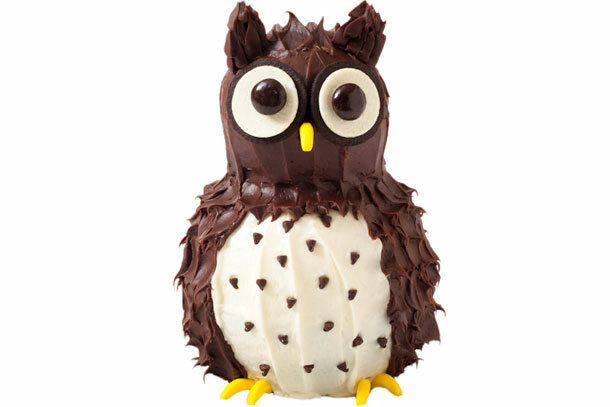 Spread the remaining vanilla frosting on the front of the larger ball cake for the owl's chest. Make smooth. Dot the chest with the mini-chocolate chips as seen in photo. Separate the Oreo cookies, leaving the cream on one side of 2 cookies for the eyes. Cut one of the cream-free Oreo cookies in half with a serrated knife to make the ears. Press the cut cookies into the top of the cake for the ears. Spread the remaining chocolate frosting over the top, sides and cookie ears. Make the head area smooth. Using the back of a spoon, lightly press against the chocolate frosting and pull to make feather-like peaks all over the body of the owl. Snip a small corner from the bag with the vanilla frosting. Pipe a dot of frosting on the head area and attach the cookies with cream for the eyes. Pipe a dot of vanilla frosting on the cookies and add the mints as the pupils. Insert one banana Runt below the eyes for the owl's beak. Insert the remaining banana Runts into the bottom of the white chest area for the owl's feet.